natetaylor wrote: Here's a quick photo of a Castle Pledge with the Crenellations pack (and Inner Walls pack). 1. Could the KS3 addon for one sided crenelations be included as an extra add-on here for those who didn't buy any and want them, so they can just be shipped together? A- Very valid request. Needs to run it by the keeper of the purse strings. A- Yes. Some options to get new pieces at a better ratio than the packs designed specifically for the pledge levels. 4. Will the right and left indented crenellations work for both the 6in tower and the 4in tower transition? A- Everything in DF is on a 4 in grid system. The 6in tower throws this off and needs the smaller crenellation transition pieces to extend both sides of the tower back to that 4in grid (8in for half towers). The 4in tower actually doesn’t need a transition piesce as both the tower and the crenellation end on a 2in mark in the grid. They line up perfectly without needing any sort of transition piece next to it. 5. Can the indent crenellations be obtained without purchasing the grand citadel crenellation pack? A- yes they will be available. 1. Are the crenelations going to be part of an add-on? A- There will be a variety of crenellations and machicolated battlements available as add-ons. 2. Will battlement add-ons be available before it his $1M? A- Crenellations yes. Battlements maybe. 3. Any word on the composition of the mountain cliff pack? A- Graphic should hopefully be up this morning (3/7/16). It's roughly 4x straights, 4x swells, 2x large curves, 2x small curves, 2x inside curves, 2x half elevation blocks, 1x cave opening and plug. 4. will there be a non crenallated battlement option ? A- Probably not. But we might unlock some pieces that are non-militaristic which you can top your walls with. 1. Will the crenellated wall toppers from City Builder nestle well with these walls? A- The crenellations will work seamlessly with the ones sold with the City Builder. They were purposely designed to work together. 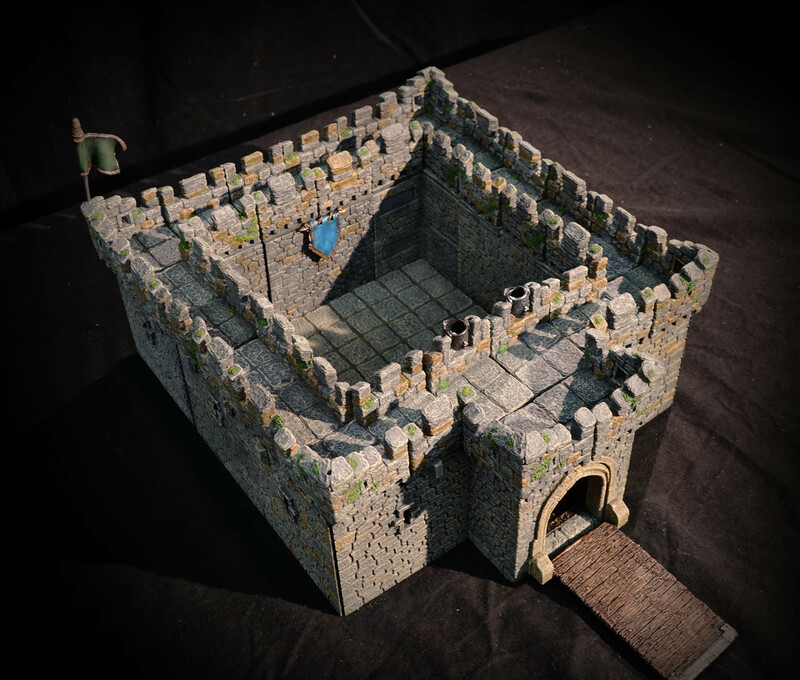 New crenellations released here are different sculpts from the ones previously released. 2. Why do the pledge levels not have crenellations?